Chris Daggett, the Independent candidate in the New Jersey election, broke into the double digits for the first time in Democracy Corps' (D) latest poll. If Daggett can pull down 10% of the electorate, as James McCarville's Democracy Corps (D) poll indicates, Corzine may have a fighting chance. The New Jersey election is beginning to resemble the Minnesota Senate Election of 2008 where Dean Barkley, an Independence Party Candidate (not the same as Daggett) altered the electoral landscape by capturing the disillusioned major party voters. If Daggett's support holds in the coming weeks, the election comes down to base turn-out, and in New Jersey, that favors the Democrat. This of course is a big if because it's just one poll and a series of extrapolations; but at this juncture, it may be Corzine's best opportunity at re-election. The landscape in Virginia continued to grow darker for Democrat Creigh Deeds as two new polls confirmed his diminishing numbers. He's been down by at least eight for the past month, with no indication of a reversal. Deeds needs something good to happen before the close of September. The figures above contain data from the close of the primary period. 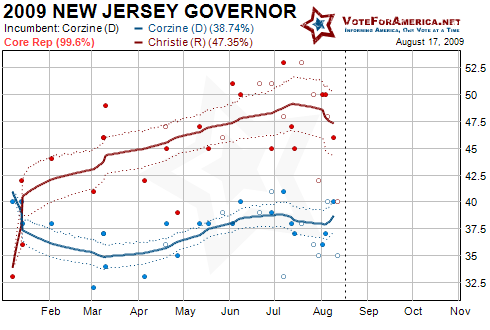 The leading candidates each filed their report electronically, but Corzine used an R1 form and Christie a G1; the reason for this difference is unclear, but they both contain the same information. Daggett has yet to file a finance report, as he was not involved in a primary election; a result of his Independent platform. The next report will be due on Oct 5, 2009 from all general election candidates in New Jersey. Each major party candidate raised and spent about the same amount leaving little to no cash on hand. And although Christie holds a slight monetary edge, I do not believe this significantly contributed to his nine point lead. Other factors are at play, but I'm sure the money will help as Christie tries to maintain his lead. Corzine has also been known to spend his own money, so if the race gets truly close, money may buy the deciding votes. Deeds was out raised and out spent during the primary period but the raw data may misrepresent the fundraising dynamics of this gubernatorial election. The nearly 2:1 discrepancy can be explained by the presence of a rigorous Democratic Primary where the donors were split into three campaigns; as opposed to McDonnell's (R) coronation as the only interested candidate. The combined candidacies of the Democratic primary actually out raised McDonnell during this time period. 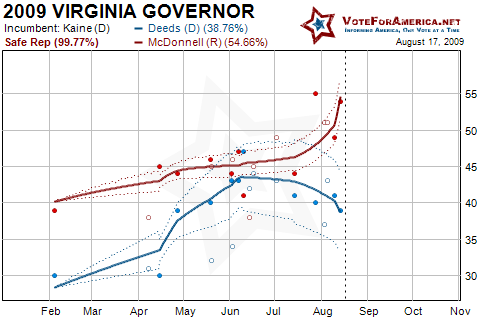 The monetary advantage for McDonnell in the past couple of months likely played a major role in his recent surge. McDonnell was simply able to focus more time and money on the general election at an earlier point in time. The direct result of this conclusion translates into his comfortable lead in the polls. If Deeds and the DNC, along with Tim Kaine, can get the Democratic fundraising machine on track, the race will likely tighten, but Virginians may have already made up their mind.